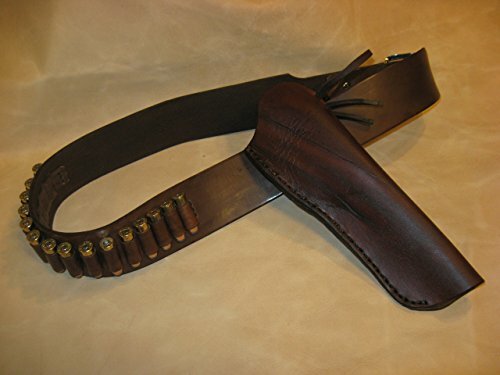 All of my Leather Holsters & Gun Belts are hand cut, hand dyed and hand stitched for a Superior Quality Leather Holster & Gun Belt that will last a lifetime. Cut from Vegetable Tanned Cowhides that are 8oz to 10oz thick (5/32" thick). 2-1/4" wide belt. Order a Belt that is 2" larger than your regular belt size. When measuring your belt measure from the heel of the buckle (where the leather wraps) to the hole typically used. Example: The belt you normally wear measures 36, then order a 38 size Gun Belt. See picture of how to measure. The Belts have 12 Cartridge Loops. The Holster is for revolvers from 4-1/2" to 9-1/2 Barrel. If you have any questions about this product by Triangle F Leatherworks, contact us by completing and submitting the form below. If you are looking for a specif part number, please include it with your message.